This story is the first part in a four-part series about our Halfsy Hero, Andi Hallgren. Our series will follow Andi and three other heroes as they train for the November 6th Good Life Halfsy. When Andi Hallgren showed up at the Training Kickoff in early August, she came ready to run. She had a relaxed smile on her face as she happily mingled amidst the other runners preparing for the group 5K. This is definitely not her first race, it’s not her first Halfsy either. In fact, Andi won’t just be running with the rest of the 6,000 runners, she’ll be leading a small pack of her own. See, Andi is a pacer. Pacers are the people in races who carry a time flag and run the race at a specific tempo to allow other runners to follow their lead and stay on track to meet their goals. It’s easy for runners to get excited about the momentum of race day, run too quickly and burn out, but that’s where pacers come in, Andi said. She has been running races as a pacer for the past four years and said she loves the way it allows her to be part of the race, but also help others compete at their very best. But Andi hasn’t always been a long-distance runner. In junior high and high school she ran track and was “in awe” of the long-distance runners. She saw their endurance, mental toughness and their ability to run for a seemingly endless amount of time. She applauded their abilities and work ethic, but was also resigned to the fact that this sort of running was completely out of her league. During her senior year in college, Andi started running again. She found it was a good way to relieve stress and unwind. She’d pop in her headphones and head outside, letting the music carry her as she ran one mile, then two, then three at a time. Overtime, Andi’s consistent running increased her mileage and soon she was one of those long-distance runners who she’d admired in high school. She ran her first half marathon the same year she started running and after that, she said, she was hooked. Running came naturally to Andi, but she knows that’s not the case for everyone. That’s why she’ll carry her pacer flag on race day. She’ll smile as she runs, shouting out words of encouragement and direction to those around her…and to herself. 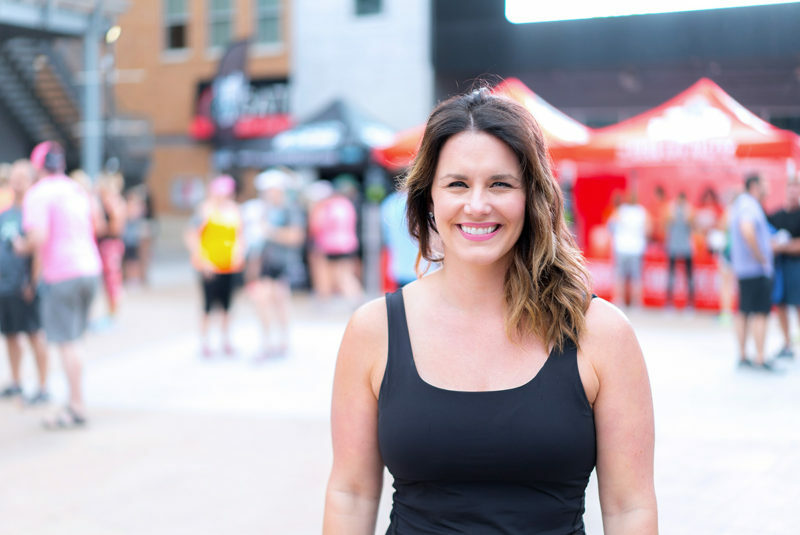 She needs the support just like the rest of the runners, because while running is one of her many hobbies, Andi has her own list of reasons why she runs. Check back for more Halfsy Hero stories and to read the next installment of Andi’s story.